As times bring about changes, the technologies we use need to be revamped. Southern Foodservices, being a leader in the food service industry, realized as times are changing, they needed to integrate a better method of utilizing their technologies to adhere to the new wave of updates so that they can better serve their business and customers. With sales and its related data being a priority, an updated environment was needed to implement faster service with a better user interface that could provide solutions to both their business and their customer’s needs. Recognizing that moving from an older SharePoint On-Premise environment to a new Office 365-based SharePoint Online environment was an arduous task, Southern Foodservices engaged in business with EPC Group and their team of Office 365 experts. They needed help to design, integrate, and migrate their data as well as implement a new customized user interface. EPC Group met with Southern Foodservices to actualize requirements for an understanding into the perspective business needs for a new SharePoint Online solution. After discussing internally to formalize the business and functional requirements, EPC Group developed the appropriate steps to implement a tailored environment that fit exactly what Southern Foodservices needed. Once the approach was agreed upon by both parties, EPC Group set out to put the plan in action. Starting with creating the new SharePoint Online environment, the structure was built as a first step to ensure the migration of data and customized interfaces, navigation, and forms would be a success while avoiding many known pitfalls. 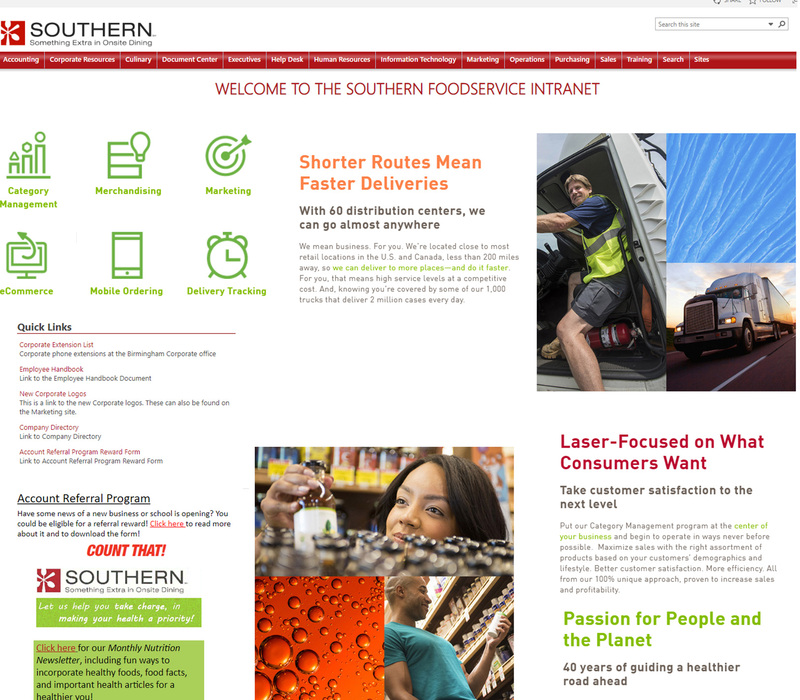 After building out the core foundation and related site structure, EPC Group completed a flawless migration of data and developed several custom solutions to recast Southern Foodservices look and feel not only for their employees but for their customers that was accessible on both desktops as well as on mobile devices and tablets.